Offering you a complete choice of products which include centrifugal finishing machine. 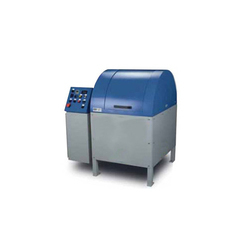 Centrifugal Finishing Machine are high ‘G’ force machines specifically developed for smaller components, and for those that require long process times in Vibratory Finishing machines. Smaller machines have removable barrels, while larger ones have fixed barrels with provision for barrel and turret inching. There are several options available -straight barrels, inclined barrels, removable barrels (for small machines), variable speeds, media parts separators, inching arrangements, rubber/polyurethane linings, conveyors, etc.